While walking around Essen looking for peculiar / unique games, i stumbled upon this small Korean booth that was selling small box games with cartoonish and colorful art on its covers. One of them was titled "The Exodus" and resembled what seemed like Moses and Pharaoh on its cover art. Being a Christian, i decided that it might be worth checking out if only so that i can use it in my classes and to introduce games to some of my church friends. 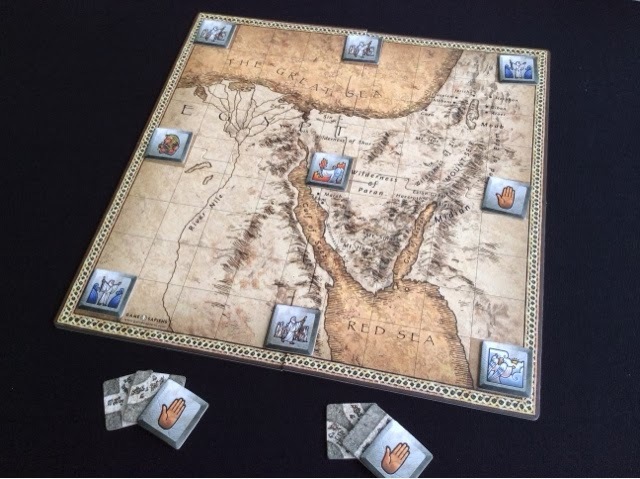 The Exodus is a 2 player only tile placement game. The game is played over three rounds whereby each player gets a turn to play as Moses and as Pharaoh. For the third and final round, the loser of the 2nd round gets to decide if he/she would like to play as Moses or Pharaoh. The winner is the player who manages to win 2 out of the 3 rounds. The gameplay is simple and straightforward. At the start of the game, 9 special tiles are placed on the board on the stipulated spaces. The spaces are fixed but the tiles are randomly placed. Of the 9 tiles, 3 are Israelite tiles, 2 are Moses tiles, the remaining tiles are 1 impasse ( stop ) tile, 1 Pharaoh tile, 1 Pillar of Fire tile and 1 Pillar of Cloud tile. The winning conditions for the round depends on who you are playing as. The Moses player is trying to connect any 1 Israelite tile to any of the 2 Moses tiles. The Pharaoh is trying to connect any 1 Israelite tile to the 1 Pharaoh tile, or to make sure that it is impossible for Moses to connect to any of the Israelite tiles. 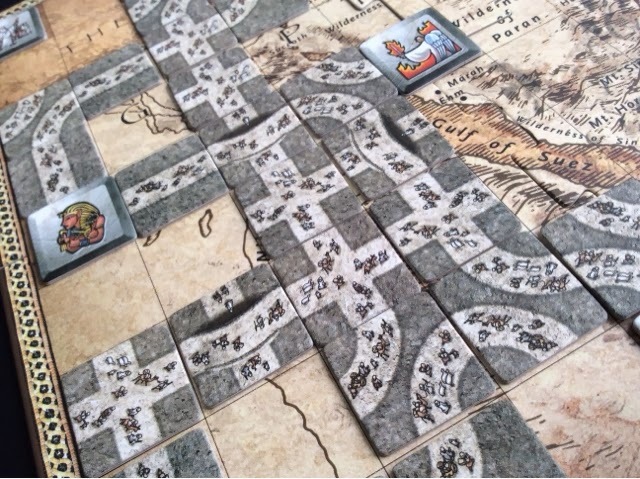 At the start of the game, each player receives 2 random path tiles and 1 impasse tile. Starting with the Moses player, each player does simply one thing during his/her turn - play a tile onto the board. That's it. This continues until one of the round end condition is met, and that player is declared the winner of that round. Just some things that can ( and cannot ) be done on the player's turn. The impasse tile works as a stop tile. Basically it acts as a dead end to any path on the board. Each player only has one of the tile so he/she will have to use it wisely. 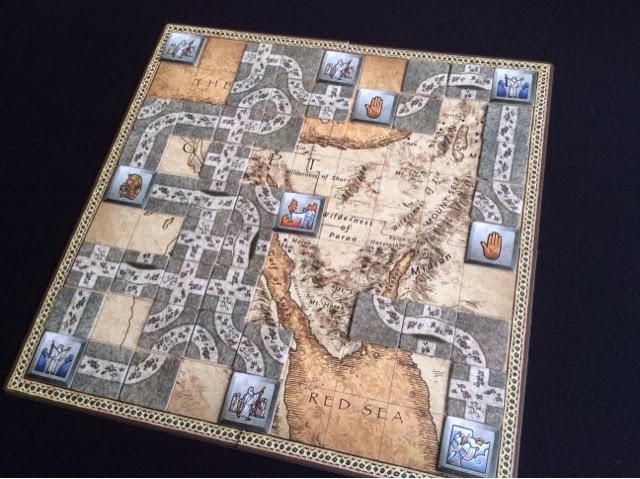 It has a placement restriction that does not allow it to be placed touching any of the special tiles on the board. The impasse tile also allows the player to discard his/her entire hand and draw back up to 3 tiles. So this can help you get out of a tight situation were you don't have the tiles you might be looking for. Players cannot immediately connect a special tile off the edge of the board ( with a single tile placement ). So this prevents players from using their turn to completely seal off the paths of the special tiles. If this was done later in the game where a road has been firmly established from the special tile, then that is allowed. Lastly, the Pillar of Fire and Pillar of Cloud tiles act as tunnels during the game. Israelite paths that connect to either of the Pillars may then exit the other Pillar tile as if they were connected. This helps the Israelites to maneuver around the board quickly and in interesting ways. 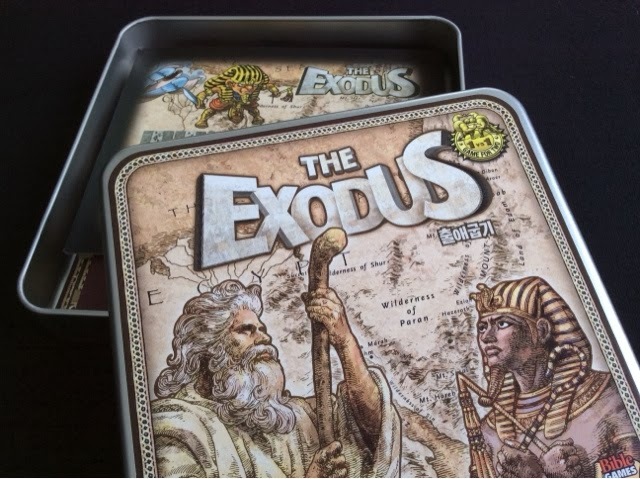 The Exodus is a short and light 2 player game that is suitable for players of all ages. Its not difficult to learn and very quick to jump right into. It may sound extremely simplistic - and in a way it is - but there are some difficult decisions and tactical planning involved in the game. There were many times when i felt torn between which direction i should route the Israelites to. Although the goal is clear, the path towards it is rarely so. Knowing that you are constantly against another force that has similar goals to you ( just towards a different tile on the map ), you are constantly wondering how much room to leave a path open without having it channeled off the board or back round towards the opposite direction. Failure and success is a very thin line in The Exodus as a well placed tile can thwart even the best laid plans. The game does suffer from the luck of the draw when it comes to tile drawing. There are often times when a curve is all you need but you will fail to receive one before its too late. I will say this falls both ways so it really does balance out throughout, but it can be extremely frustrating when what you need is never at hand. 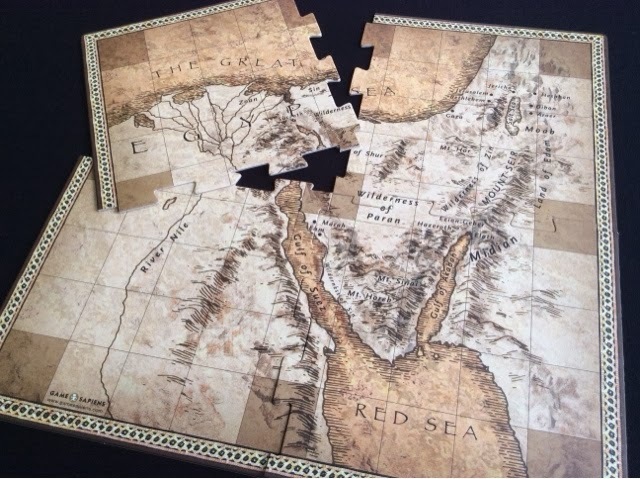 The way the special tiles get laid out at the start of the game can also influence how easy it will be for the Moses or the Pharaoh player. You may find your much needed goal a mere 3 tile distance away from you in 2 directions and that could be very favorable for the player in question. I have played a few games of The Exodus and i like how each game didn't feel the same. The random layout at the start certainly helps, but i think the fun part is how your opponent reacts to your plans and how the tile draw makes you consider the options and direction to take. When both players are evenly matched tactically, you will find that the game really comes down to the wire where there are only 5 or 6 spaces left on the board. Quite tense indeed. Components wise, i am slightly disappointed with the jigsaw puzzle board. It doesn't lay completely flat when pieced together and it really irks me quite a bit. It isn't extremely warped, but it does rise at all the wrong places ( center of the board, near the edges ). Even from the photo below you can see the bottom middle doesn't sit well on the table. Considering the tiles you place are light, this rising up can make it look like an earthquake went through Egypt. The art is very minimalist but sufficient for the type of game it is. I love how the board art is just part of a map with no particular buildings or other colors to distract from the gameplay. The tiles are very nicely done with art of the Israelites walking all over the place. They may look like ants from afar since it is small but on closer inspection you can see sheep and camels prodding along. Quite how i would have imagined it to be back then when they were wandering the desert. All in all, i am very pleased with my purchase of The Exodus. It sits nicely in my 2 player collection as a game that i can take out and teach within minutes, and be off playing and done within a half hour or so ( possibly less ). Each round lasts perhaps 7-10 minutes tops and although short, it gives off a very satisfying game fulfilling fix. You do have to go in knowing that it is light and not the heavy thinky kind of one v one game. Once you can see it in that light, i think you will find much to enjoy in this little gem. And no, you don't have to have any bible knowledge nor appreciation of the religion to enjoy the game.